The pairing of a first-time documentary director with a first-time feature producer--who hadn’t planned on assuming that role--has yielded a breakthrough piece of work chronicling a story far greater than originally envisioned, and along the way earning plaudits which include a Best Documentary Feature Oscar nomination, a DGA Award nom, a 2017 Sundance Film Festival Orwell Award, two Cinema Eye Honors, a Critics’ Choice Award for Best Sports Documentary, and a BAFTA Award nomination for Best Documentary Feature. 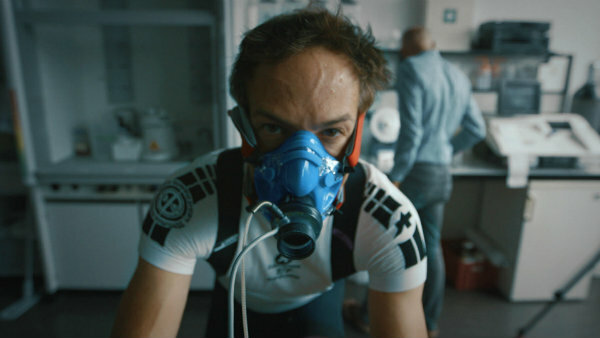 That documentary is Icarus (Netflix) and the director and producer, respectively, are Bryan Fogel and Dan Cogan. An entertainment industry veteran active in live theater and feature filmmaking, Fogel initially intended with his first documentary to delve into sports doping and how star athletes--such as champion cyclist Lance Armstrong--are able to avoid detection, passing assorted drug screening tests. Icarus follows Fogel as he takes performance-enhancing drugs to see if they will strengthen his endurance as an amateur bike rider. He then seeks out help on how to test clean, leading him to Dr. Grigory Rodchenkov, a maverick Russian scientist who’s expert at beating the system. Over a period of months, the two form a bond as shocking allegations emerge placing Rodchenkov at the center of Russia’s state-sponsored Olympic doping program. For Fogel, the first-hand guinea pig premise of his documentary gives way to a much bigger story, arguably the biggest international sports scandal in history which he and Rodchenkov are positioned to expose to the world at large. Rodchenkov eventually flees to the U.S., leaving his family behind and in fear for his life. The suspicious death of a colleague back in Russia underscores that Rodchenkov is in mortal danger. Getting this story out to as large an audience as possible became paramount--not just for exposing the scandal but also because the more attention Rodchenkov gets, “the safer he will be,” said Cogan. Netflix has been an invaluable platform, literally, for documentary filmmakers, bringing a reach of 190 countries spanning 120 million homes and 600 million people. Thus many Russians were allowed to compete in the ongoing Winter Games in South Korea. “If it had been Guatemala, Nigeria, Somalia, any smaller country, there would have been no problem with outright banning. But with Russia, the money involved, there’s a different level of accountability,” said Fogel. So even though Icarus uncovered what Fogel described as “a shocking level of fraud and conspiracy” going up to the highest level of the Russian government, viewers aren’t hearing that story in NBC’s coverage of the Games. Fogel said there’s “a level of complicity” by international sporting bodies, even NBC which paid megabucks for the rights to the Olympics and doesn’t want to hurt viewership numbers for the Games. The overseeing bodies entrusted with protecting clean athletes and the values of the Games have abdicated those responsibilities, camouflaged said Fogel by “the illusion of love and brotherhood” that the Olympics are supposed to be about. Fogel cited George Orwell’s observation that “sport is war without the weapons.” And for an event such as the Olympics, sport, noted the documentarian, is “a geopolitical weapon showing the power and strength of that country,” a concept which Russian President Vladimir Putin has embraced as his approval rating in Russia “skyrockets” with each Olympic victory.